The Cliff Rose is a member of the Rose Family. It is a medium size shrub or small tree with shredded bark which grows to between 8-20 feet in height. Leaves are dark green on top and whitish beneath with a waxy coating to 1 inch in length. The plant typically grows in desert grasslands and pine/juniper forests in dry rocky soil at elevations between 3500 - 8000 feet. 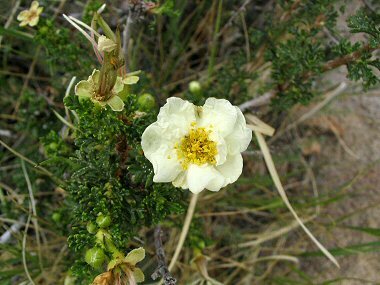 Cliff Rose is often browsed in the winter by deer and cattle. Native Americans used strips of the plants stringy bark to construct mats and clothing. Cliff Rose typically blooms between April - September and produces a cream colored flower with 5 petals and a yellow center to 1 inch in width, followed by 5 - 10 fruits to 0.25 inches in length.